« The Ten Best Christmas Movies – Relay Race. Starring: Johnny Harris, Ray Winstone, Ian McShane, Michael Smiley, Luke J.I. Smith, Anna Wilson-Hall. Let’s face it, boxing is a brutal and unforgiving sport. But it’s also reflective of class. Rarely, if ever, is it taken from the point of view of the privileged or the upper-classes. It’s a sport that offers the working class a chance to break free from their poverty or a chance of absolution from personal demons or afflictions. From Rocky to The Champ or Raging Bull to The Fighter, boxing flicks often provide raw and gritty, blue collar entertainment and Jawbone is no exception. Plot: Jimmy McCabe (Johnny Harris) was once a youth boxing champion but now he’s a man who’s hit rock bottom and lost his way in life. After having recently become homeless and battling a long-term alcohol addiction, Jimmy looks to the only salvation he has left. He ventures back to his childhood boxing club where meets up with gym owner Bill (Ray Winstone) and corner-man Eddie (Michael Smiley). They’re reluctant to welcome him back but if he can prove he’s off the drink and show dedication then they’ll give him a chance. What then becomes of Jimmy is entirely in his own hands. 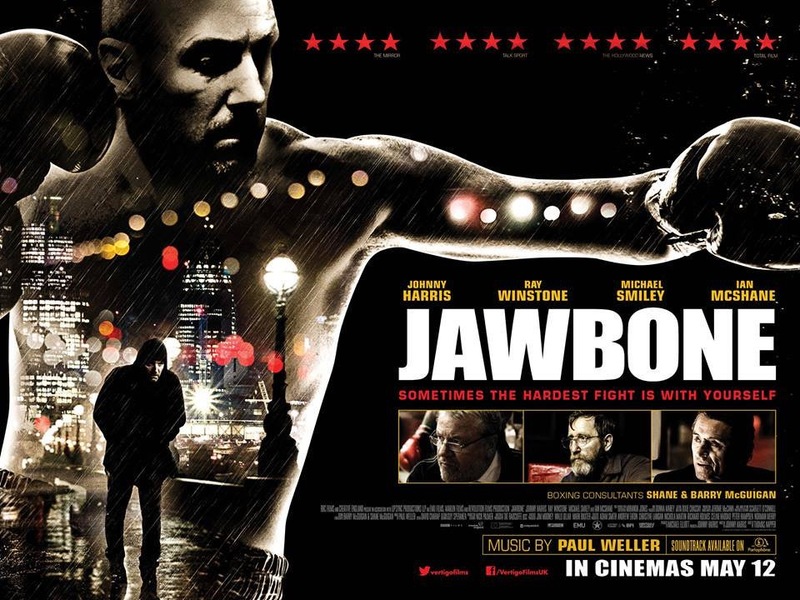 Jawbone, or The Ballad of Jimmy McCabe, as it’s also known is not so much a rags-to-riches tale than a rags-to-stitches one. There’s no big prize fight for Jimmy. Instead, all he can hope for is a few grand in his pocket that doesn’t warrant the extensive risk he takes. This is very much a simple human drama of one man’s fight with alcoholism and how boxing becomes his focus to find some redemption in his life. He’s not going to become an overnight sensation. All he can expect to achieve is a focus in his life and the possibility of clinging on to his sobriety. At it’s centre is the hugely underrated Johnny Harris. This is an actor that has went unnoticed for far too long and anyone familiar with Shane Meadows’ sublime This Is England television mini-series will be aware of how effective and powerful a performer he can be. It’s an absolute disgrace that Harris hasn’t caught the eye of more casting agents and hopefully this is the film that will change that. With this in mind, if you’re not getting the opportunities you deserve within the industry then why not make them for yourself? Harris has done just that by emulating what Stallone did with Rocky – he personally wrote the screenplay and gave himself a meaty lead role where he’s able to showcase his abilities. His Jimmy McCabe is a tortured soul and despite Harris’ tough exterior there’s a gentle, empathy behind his eyes. Harris manages to convey a troubled man that’s also pure of heart. There’s only one issue with Jawbone and that is that it feels slightly undercooked. Harris has a written a strong three dimensional character and he manages to get us to care and invest in him but with so much attention on this character, it feels that the rest aren’t given as much. Both Winstone and McShane are underused and I got the feeling that they only agreed to appear to lend a bit more weight to the project – which ultimately I’m thankful for. It was the slightly rushed denouement that irked me most, however. I wanted to see more of the story and what became of Jimmy but I suppose that only confirmed how invested I was in the character. That said, this is not the type of film that could’ve had a satisfactory ending. Just like the alcoholism that Jimmy battles, it’s a never ending disease that has to be taken one day at a time. Playing out like a Ken Loach, kitchen-sink drama, this is a grim and unflinching look at poverty and addiction. Boxing comes secondary here but Harris comes second to no-one – he gives a towering central performance that simply can’t be overlooked. Trivia: Johnny Harris started acting at his local Union Street Theatre which gives its name to the fictional Union Street Boxing club in the film. This entry was posted on December 11, 2017 at 8:00 pm and is filed under Drama, Sport with tags 2017. You can follow any responses to this entry through the RSS 2.0 feed. You can leave a response, or trackback from your own site. Haha, love that line! I do like a good boxing movie Mark and this might be one I have to search out. Johnny Harris, eh? Cool! If you enjoy a good, gritty boxing flick this should do the trick mate. I really liked it. It felt a little rushed towards the end but that’s mainly because I didn’t want it to end. And, yeah, Johnny Harris – a very underrated actor. He’s always excellent in what little he appears in. Good stuff bro. This one is new to me but sounds intriguing. It’s amazing how many boxing stories find their way to the big screen. This is a solid, gritty film, bro. Well worth a look. If like a good boxing flick then this is a good one. Very low-key and understated but all the better for it. I like the sound of this. The way you describe it, there will be no prizefight, he won’t be a sensation. It sounds very human. This is playing at a film festival, I will catch it I think. Have always loved boxing too. If you get the get chance, then jump on this one, man. I’d imagine that it won’t get a wide release anywhere other than the UK. It’s very, very good. I hope you enjoy it as much as me. Although I say “enjoy”, it’s not exactly entertainment. It’s just gritty and raw storytelling. Let me know how you get on. We’ve already spoke bud but I’ll keep my eyes peeled for your review. Playing catch up at the moment. No worries mate, it was an intense film, I am still trying to find the right approach to such an intense film. I like what you said about boxing movies reflecting class, an extremely astute observation. Cheers Vinnie. It’s definitely a sport that reflects class. Very much a working class deal that the middle and upper class make a fortune from. Typical of society in terms of the ruling classes watching the under classes eat themselves. Oh I totally agree. That’s why it’s good when the fighter really socks it to those who think they are higher. Fine work Mark. British boxing films are something of a rarity so we should celebrate when one comes along that is genuine quality. Couldn’t agree more, mate. And this IS a good one. I was very impressed with its approach and Johnny Harris’ performance. Looks good, there’s just something about boxing. It’s a good film, Lloyd. Probably won’t receive much attention but it deserves it.